Forget the Kindle, Sony’s readers and iRex—the tech world predicted the Barnes & Noble Nook to be the top dog this year in the e-Reader race. But how do those predictions stack up against the reality of hands-on reviews? The Barnes & Noble Nook reviews have been pouring in today and so far the reports have been rather mediocre. For all of the hype this eBook reader has received the tech industry was expecting to see fireworks—but instead, the intriguing device left most reviewers a little “underwhelmed.” Most reviews draw the inevitable comparisons to Amazon’s Kindle since it was the first device to bring eBooks into the mainstream. The reviews weren’t bad, there were actually many positive aspects to the Nook reader such as its large eBook library, built-in free wireless data network, Wi-Fi connectivity, and its color touch-screen pad. The major complaint about this device is it can be a little sluggish in booting up and accessing a book. 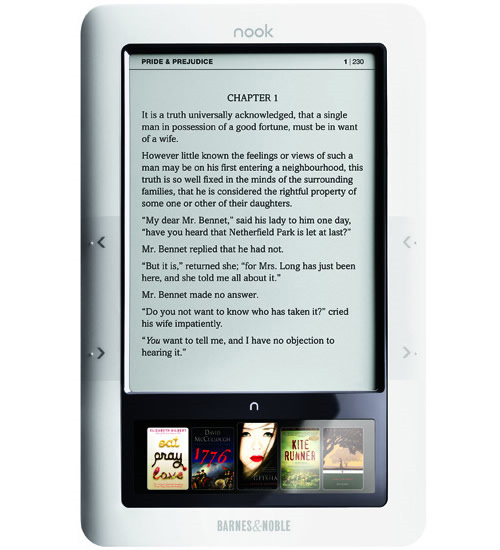 This is natural with all new devices—the Nook has kinks—and those will soon be revised and worked out. But for now, here are what expert reviews have to say about the Nook. CNET says the Nook is in need of some software updates to improve the navigation features and to speed up browsing—but, they were pleased with the Nook’s lending of e-books and all of Barnes and Noble’s in-store options for its new e-reader. Engagdet seems fairly disappointed in the performance they received from the Nook, noting that it was slow and fell “short on delivery.” In contrast, Engadget also praised the Nook for its LendMe feature and thinks that some software revisions will speed things up for future users. Gizmodo has a similar take: They said the Nook’s Android software is definitely in need of an update, but they believe these fixes will come fast and that the future looks hopeful for the e-reader.